We begin 2018 on a positive note. Last week’s Chicago PMI posted its third straight plus 60 score and is on the best streak for the index in over three years. We expect similar positive results this week from the various manufacturing reports released. The theme of these reports is positive economic growth. After hovering around 2% for 2016 and into last year, GDP has topped 3% each of the last two quarters. 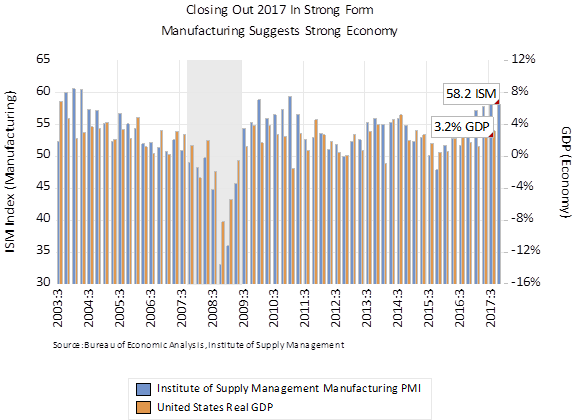 We expect that this week’s data on manufacturing will point to an economy still enjoying a cyclical upswing. Macroeconomic Advisers and the Atlanta Fed’s GDPNow model expects 2.4% and 2.8% fourth quarter real GDP growth, respectively. Given our expectation for continued strong momentum through December, we could easily envision an even higher growth rate for the quarter when all is said and done.